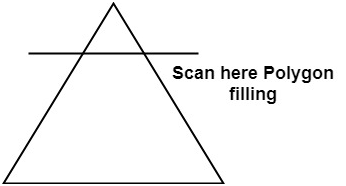 This algorithm lines interior points of a polygon on the scan line and these points are done on or off according to requirement. The polygon is filled with various colors by coloring various pixels. In above figure polygon and a line cutting polygon in shown. First of all, scanning is done. Scanning is done using raster scanning concept on display device. The beam starts scanning from the top left corner of the screen and goes toward the bottom right corner as the endpoint. The algorithms find points of intersection of the line with polygon while moving from left to right and top to bottom. The various points of intersection are stored in the frame buffer. The intensities of such points is keep high. Concept of coherence property is used. According to this property if a pixel is inside the polygon, then its next pixel will be inside the polygon. 1. Staircase or Jagged: Staircase like appearance is seen while the scan was converting line or circle. 2. Unequal Intensity: It deals with unequal appearance of the brightness of different lines. 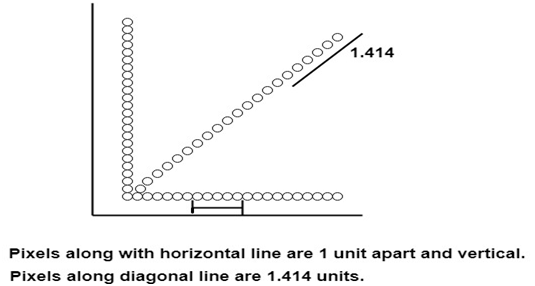 An inclined line appears less bright as compared to the horizontal and vertical line.